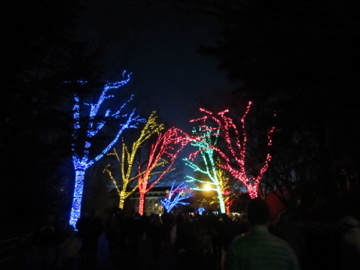 Zoo Lights at the National Zoo in Washington, DC that I visited with old friends that are practically family to me now. I don’t know about anyone else, but for me, the weeks surrounding the transition into a new year is always a time for reflection for me. For the past couple of days, I’ve been thinking about how lucky I am for the friendships I have developed over the years. In fact, my father used to always tell me that if I could turn my ability to make and stay in touch with friends into something I could have made millions….. maybe if I had listened to him and pursued (and if I were a lot smarter, creative and better with technology) that I could have beat Mark Zuckerberg to creating the world’s largest social network. Hmmm, what would I have named it…… but I digress. Many of my friendships came about the traditional ways – growing up together: getting through awkward phases in elementary school, insecure phases in middle school, starting to figure out who we were in high school, exercising our new-found independence in college or just bonding over tough real world experience together. But then there are others with whom I’ve managed to form special bonds with just due to travel alone. There were the Australian girl and British girl who my cousin and I randomly met on a train bound for Venice, with whom we bonded over hunger & the lack of a food service/cafe car on a long ride. We’ve since lost touch, but we spent a great day together in Venice and I visited them in London twice after that day. There were the girls from San Diego, CA and Cheyenne, Wisconsin who I bonded with during a one-week training course in South Carolina, who I was so sad to leave behind that we soon thereafter planned a girls weekend in Las Vegas, NV, and have stayed in touch ever since. In fact, I believe I’ve found, particularly in the one from San Diego, a lifelong friend & kindred spirit. There is the friend I met at a wedding in Canada, who I barely knew when I went to visit her in Jordan, for the simple reason that I was feeling isolated in Djibouti for the holidays and needed to get away for a little while. Spending New Year’s last year with her and her friends in Aqaba, Jordan was totally random, but I had a fantastic time making new friends there that life would probably never have otherwise brought across my path. There are my classmates from an international graduate program – no more than two of us in our program came from the same country, and we took every opportunity to travel together during that year in Europe. Since we completed our program, I’ve gone to New Zealand and Mexico for weddings for former classmates, seen a couple of them in Holland, visited another in Australia and met up with her in Portugal too. Some have come to visit me here in the US too. There was the random Dutch girl my coworker and I met by the pool in Abuja, Nigeria, who made us feel welcomed and showed us around the city way more than our hosts did. There was the woman I worked with in Cameroon who took me under her wing when I found myself stranded in Yaounde for a day longer than everyone else, who taught me to cook Egusi pudding – a traditional Cameroonian dish. There was the young woman I worked with in Zanzibar, who took mercy on me for being a woman traveling alone in a Muslim country and invited me out for meals and to meet some of her friends. There’s a couple I met through a mutual friend who moved to Africa around the same time as me, and who welcomed me into their home in Arusha and went on safari in the Ngorongoro Crater with me. And most recently, there are all the expats I got to know in Djibouti, and while some have remained in Djibouti, many of whom have since scattered around the world – from Afghanistan, to Dominican Republic, to Mozambique, to Chad, to various parts of the US like Omaha, NE and Washington, DC. Our shared time in such a different environment than what most of us were accustomed to made for a great opportunity to get to know each other and bond over shared unusual cultural experiences. Thanks to social networks like Facebook, it’s easier than ever to keep track of your new friends no matter where they move. And these friendships can inspire you to visit places you might never have considered. For example, there’s the woman I worked with in Ethiopia who I hope I’ll get a chance to visit in Malawi on a future trip to Africa. And Facebook, or other social networks and even just google might let you find that nursery school friend you used to dress up in tutus with who has since moved to Melbourne, Australia that maybe one day you’ll get to visit. So as I enter into this new year, anticipating a chance to travel to Greece for another friend’s wedding among 2012’s trips, I’m thankful for the friends that travel has brought into my life. And I’m happy not only to have gotten to know these great people, but also for the opportunity and inspiration that these friendships provide me for future trips. It gives me the chance to dream about reunions in far-off lands, doing what I love most: exploring new lands and cultures. For those I know and love, reading this from afar, may 2012 bring us back together. For those I haven’t met yet, may the coming year find us crossing paths and forging new friendships. And to all, may all your dreams for the future come true!